Starring: Daniel Radcliffe, Emma Watson, Rupert Grint, Ralph Fiennes, Maggie Smith, Alan Rickman, Michael Gambon, Evanna Lynch, Helena Bonham Carter, John Hurt, Kelly MacDonald, Jason Issacs, Helen McCory, Tom Helton, Ciaran Hinds, Matthew Lewis, Bonnie Wright, Jim Broadbent, David Thewlis, Gary Oldman, Emma Thompson, and Robbie Coltrane. Rated: PG-13 for violent battle scenes and favorite characters tragically dying. I had two recent conversations about the upcoming end of the extravagantly epic 10-year Harry Potter film series with two very different people. One, a friend who was a diehard fan, was concerned over the final film, as she had rarely considered any of the films particularly well adapted, often leaving out crucial character details or stories. The other, my father, has watched almost each of the films, but every time he believes that he must have missed one of the movies. He hadn’t, but that is what separated J.K. Rowling’s Harry Potter from our other gigantic mega-titan film series, The Lord of the Rings. Peter Jackson’s adaptation of J.R. Tolkien’s epic found a way to bring in new fans, while still pleasing almost each and every one of the diehard hobbits. 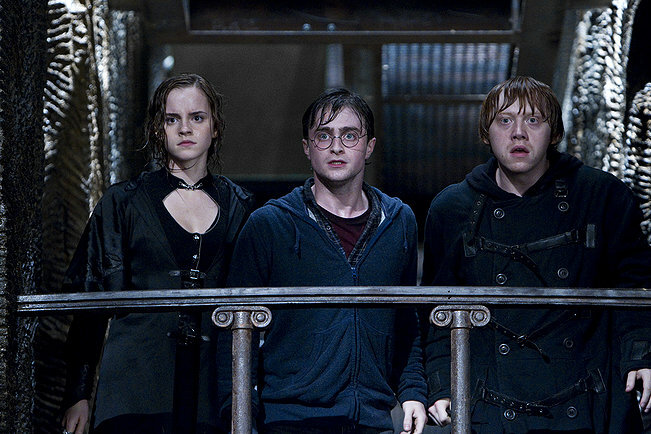 With Harry Potter, Warner Bros. has constantly gone back and forth on what the series should be, including hiring three different directors before settling on David Yates, who did the last four films. And so, we’ve come to the end of it all as the posters on buses and billboards have constantly reminded us, and Harry Potter and the Deathly Hallows, Part II is the final hurrah for this seven book, eight film series. Having Pottered-out after finishing the last novel back in 2007, I went in cautiously into this last film, knowing that the final three hundred or so pages that was left to cover was wall-to-wall action, as all the character development had been covered in Part I. That one, controversial for fans for having more relation to Tarkovsky than Ms. Rowling, was my personal favorite, as the characters came to terms with adulthood and the fear of the unknown in a unique and moving matter. But Part II is spectacle with a capital S, and for the most part, it’s a major step toward fan service and making sure everything goes out with a bang. People who haven’t opened a page or haven’t carefully studied each line in the previous films will be utterly lost, as Part II doesn’t bother setting anything up than jumping into the action. Our young heroes—the famed Mr. Potter, his trusty sidekick Ron, and the beautiful and intelligent Hermoine—have to track down the last remaining Horocruxes (parts of the evil Lord Voldermort’s soul hidden in objects) before battling the dark wizard himself. The film begins with an epic heist at a goblin controlled vault before heading to Hogwarts, the school where it all began. Once we get there, we begin the parade of characters, brought in for their two minute camoes, as all out war breaks loose. There’s Maggie Smith, putting on her charm as leader of the resistance. Helena Bonham Carter shows up as the cruel wizard with a twisted nerve only rivaled by her smile. The list goes on: Michael Gambon, John Hurt, Jason Issacs, David Thewlis, Gary Oldman, Emma Thompson, and we add two new characters as well with Boardwalk Empire’s Kelly MacDonald and Ciaran Hinds. The whole thing feels a little too much like a curtain call, but the look and tone of the film is quite the opposite, as Mr. Yates and his screenwriter Steve Kloves have made this a life and death battle more resembling the bombing of London. 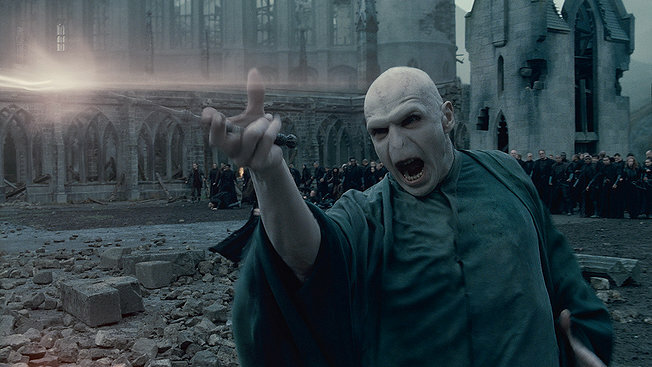 Explosions go off left and right as Harry comes to terms with the evil he must face—Lord Voldemort, played by the Ralph Fiennes, who has perfected his snake life whispers and gestures. Mr. Yates keeps the whole thing moving at a face pace, quickly throwing plot detail after plot detail, including an extended flashback following the history of Snape, a tormented character Alan Rickman has perfected through these films. If the epic battle felt a little flat on page (Rowling is a creator of worlds; not Steven Spielberg), Mr. Yates turns up the action, as he and director of photography Eduardo Serra make this a battle for the ages, modeling themselves in the vein of Mr. Jackson’s idea of scale. The whole thing is an assault on the eyes, but those sitting through this will be satisfied over and over as they watch young Mr. Potter become the epic hero he was always meant to be. And over these films, we’ve watched the young Daniel Radcliffe, along with Emma Watson and Rupert Grint, transform from a child actor with bad line delivery to full-fledged thespian. Ms. Watson and Mr. Grint are surprisingly sidelined for much of this adventure, and the focus is all on Harry and Voldemort, and the final battle against good and evil we’ve been waiting to see on screen since we first read about the boy who lived. I was impressed, though somewhat tired by the end of it. Having grown out of the Potter series years ago, I enjoyed Mr. Yates and Mr. Kloves unique takes on the sixth and seventh films, which would have been unintelligible for non-fans, but attempted to comment on a different aspect of the books than Ms. Rowling did (to the annoyance of many). Here, it’s fan service along the way (though my favorite aspect of the novel—the controversial history of Harry’s mentor Dumbledore, is only briefly passed upon). Fans will be cheering and crying in droves; I kind of left dazed and unaffected. It’s over for Mr. Potter (at least till the reboot or spin off comes after Warner Bros. finds no suitable franchise replacement), and to sustain a series with such great thespians, technical achievement, and discovery of excellent talent, is simply awe-inspiring. I simply wish, I didn’t feel like such a Muggle at the end of it all.